Castle in the Air: Happy Days are Here Again! It has been a desperate week for the Blue Castle Badger. Our post about his fixation with Jean Wilson's Pushing the Envelopes weblog, along with a promise for more illustrated letters for him to snuffle, persuaded him not to leave us for a more abundant mailbox. But when our promise failed to materialize immediately, the Badger was nearly impounded by the mailman for savagely attacking his bag. Since then we haven't been able to trust the wee fellow and he has been grounded to the back room, where he sulks in a pile of shredded junk mail envelopes. All this is to say that when the latest fresh crop of illustrated letters arrived it was quite a scene. Ecstatic does not begin to describe it. I can say that anyone would be thrilled to receive the beautiful correspondence we have gotten in the last few days. 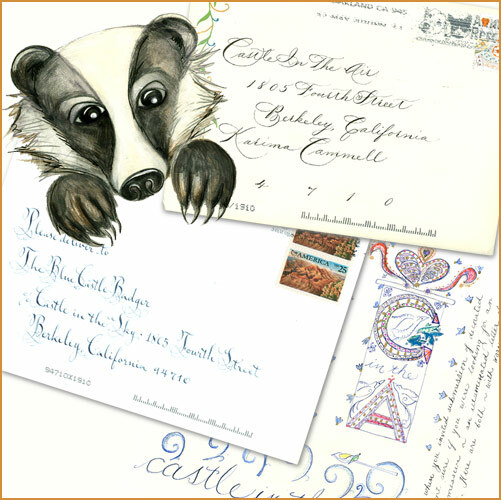 Each has been an exquisite example of artistry and penmanship. Treasures all! A warm thanks go to Peggy, Jean, and Patricia for taking the time and initiative to help us and the gratified, much happier Blue Castle Badger. Lucky Badger! What glorious treasures!